Destiny has come calling to gamers everywhere as Bungie, the game producer that brought the world Halo, offers several game elements, styles, and genres in one action role-playing, first-person shooter (FPS). Though the story gets deeper than needed, players can easily find amazing experiences, challenges and victories amid a post-apocalyptic world set 700 years into the future. There have been so many acronyms flying around that describe Bungie’s game titled Destiny…FPS, RPG (role-playing game), MMO (massive multiplayer online), and even the relatively new SWS (shared-world shooter). The assessment of the amazing game Destiny really comes down to the only two things most players care about – 1) a high entertainment value on many levels and 2) a worthwhile purchase due to the high replay value…it succeeds in both. Most of the game’s differences can be distinguished in the tagline “Defeat our enemies. Explore new worlds. Become legend.” I have found the exploring to be the biggest factor where players spend the most time in the game with acquiring weapons and armor to be the most important for progression. Whatever way you play this game – it’s a fun, immersing and very entertaining endeavor. Times are tough now after a Golden Age of prosperity where a mysterious “Traveller” visited humans, which prompted the antagonistic “Darkness” to destroy much human life and civilization. Players can stick to that core just fine while interpreting and immersing several other elements that really don’t enhance the story or clarify it on a high level for players. The vague elements could also build to future storylines, but right now they make more of a distraction than a refinement. The last remaining society (a.k.a. The Tower) depends on the player where they get notoriety for preservation of the entire human race, acceleration of abilities (the quicker the better), and conquest of the environments (a little too much exploring here). The environments build on their considerable “wow” factor with nice variety without frustrating players navigating through them to complete missions. Players get two character profiles then choose a race and a class. Each class (Guardians are titan, warlock, or hunter) choice affects character development and gameplay. Each class also has a unique focus ability (offensive, defensive or buffing) that can be real difference makers in co-op missions and competitive match play. A focus super is even more powerful and has a corresponding skill tree for upgrades. Players can customize their appearances and switch between a first person and third person perspective. Powerful weapons and armor plus vehicles are available later in the game and are prime elements to use against the increasingly challenging enemies. Vehicles include the fast sparrow, pike, and intercept (tank). The standard currency to get weapons and equipment expands with “Motes of Light” later in the game. Attacking multiple (and largely relentless) enemies can be intimidating at first. Bosses are surrounding by protectors. My favorite technique was firing a few shots to knock a close enemy off-balance then running at them to finish them with an effective melee attack, which saves ammunition and works well because it takes most of them a while to recover. Bosses are hard to bring down, which prompts players to get the advanced powers and abilities as soon as possible. The repetitious stop, duck, cover, and shoot methodology quickly reaches limits with bosses as developers prompt players to earn and learn more effective actions quickly. This recommended progression unveils appealing weapons like sleek handheld cannons. Several enemy encounters need more variety in their AI movements and tactics though they are quite relentless. Peter Dinklage (Game of Thrones) voices an autonomous robot (a.k.a. Ghost) who assists the playable “Guardian” main character in their quests. These Ghosts maneuver through the air and have one giant sensor/eye to see the world. Vanguards, merchants, and other characters are memorable thanks to high quality voice talent including Bill Nighy as The Speaker, Shohreh Aghdashloo as Lakshmi-2, Peter Stormare as Arach Jalaal, Cree Summer as Guardian EXO, John DiMaggio as Banshee-44, and Nathan Fillion as Cayde-6. The main single player campaign lets players replay previous missions at a higher difficulty level. The co-op missions and cooperative or competitive multiplayer modes require Web connection, so make sure you service is working well. Patrols and strikes are smaller experience that add some variety, but diminish when unskilled/impatient players drop out. Destiny accommodates one to twelve network players (online play required). Developers put considerable effort into matching players well. The “appointment gaming” elements are also very appealing. The controls work very well, especially when shooting weapons. It’s more satisfying to get those devastating single hits throughout gameplay plus the special powers help give you the dominating devastating blows instead of firing endless rounds into baddies (their health status usually appears above the center of their head). The great control response helps players maneuver well through tight corners, flank enemies, and fire ranged weapons, Weapons switches (triangle button on PS4) can be a bit sticky and require some adjustment along with holding buttons for actions. Movements like sprinting and double jumping are easy. The music soundtrack includes work from musicians Michael Salvatori, C Paul Johnson, Martin O’Donnell, Skye Lewin, Stan LePard and Sir Paul McCartney who performs the “Hope for the Future” song when players finish the main campaign. This high quality music production injects more emotion into the story and elevates the sci-fi, action experiences. You cannot really go over-the-top with the music within this genre. Developed by Bungie and published by Activision, Destiny comes highly recommended from these reviewers. We liked the game enough to purchase our own copies (reviewer copies were hard to come by since Bungie wanted players to get a full experience first before evaluating this game). Bungie started making great games with 2001’s Halo: Combat Evolved and sticks to their guns well after the highly successful BETA test in July 2014, which drew approximately 4.6 million participants. 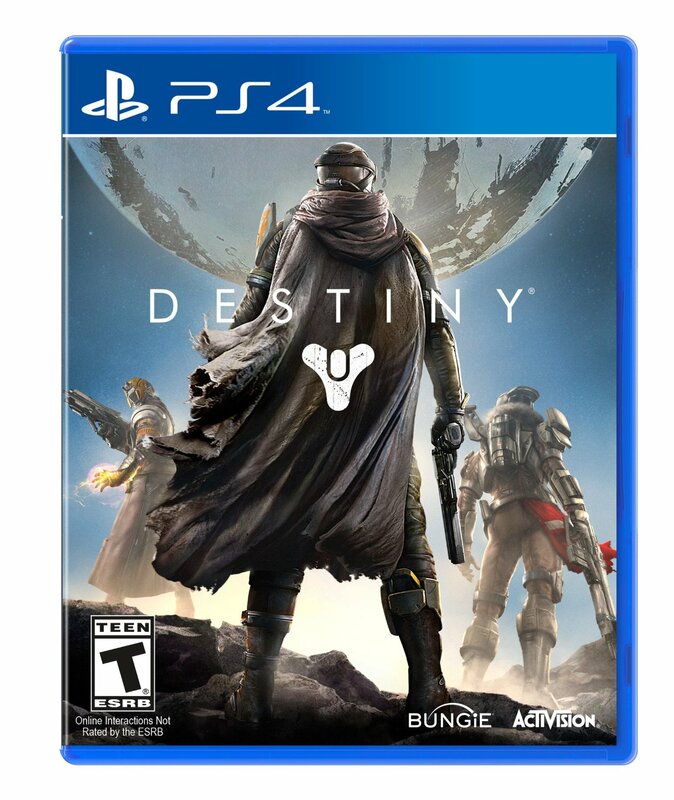 Destiny retails for $59.99. The PlayStation 4 version includes a code for Vanguard Armory (Vanguard Quartermaster in the tower) and free 30-day PlayStation Plus trial. Also available on PlayStation 3, and Xbox 360 plus varied edition on all console versions. Bundles available for Xbox One and PlayStation 4. Season Pass also available. Expansions, The Trial King Edition, and Sparrow racing further expands the highly recommended (***1/2 out of four stars) Destiny experience. This entry was posted in Video Game Reviews and tagged Destiny, Michael Siebenaler, Mike Siebenaler, PlayStation, PlayStation 4, PS4, Tall Writer, video games. Bookmark the permalink.